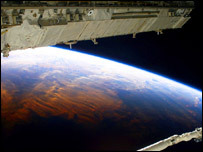 Nasa has decided a further spacewalk to repair a torn thermal blanket on the shuttle Discovery is not necessary. 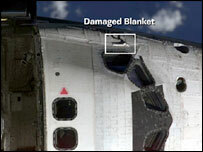 The US space agency told the seven crew members the shuttle would be safe for re-entry, due on Monday, despite the torn blanket below the cockpit window. On Wednesday, astronauts removed protruding material from the orbiter's underside which was threatening the heatshield's integrity. 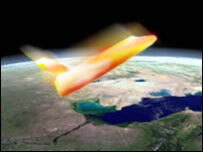 It is the first mission since Columbia overheated and broke up on re-entry. If Nasa had decided upon a further spacewalk, it would have been the fourth carried out by the Discovery crew. Mission Control announced its decision to the crew by saying: "We have good news". 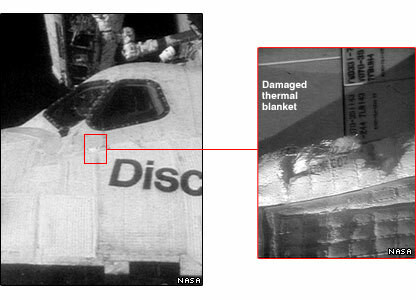 It later said mission managers debated the issue for several days, but decided, "the blanket is not an issue for heating as the space shuttle goes through the high temperatures of re-entry and neither is it a problem in terms of debris." Astronauts Soichi Noguchi and Steve Robinson have already done three spacewalks, including a pioneering one around the shuttle itself. Earlier, deputy shuttle programme manager Wayne Hale said Nasa's concern stemmed from an abundance of caution since the Columbia disaster. "I think in the old days we would not have worried about this so much," he told journalists. "We're just pounding this flat. We're not going to leave any stone unturned at this stage, to make sure the crew is safe during re-entry." Meanwhile, controversy has broken out over whether the space agency heeded warnings about possible technical problems to Discovery ahead of its launch. A leaked internal report from last December warned of deficiencies in the way insulation foam was being applied to parts of the fuel tank to be used by Discovery. A piece of foam fell off the tank during Discovery's launch, prompting Nasa to ground its entire shuttle fleet. But despite strong criticism about practices at the plant in New Orleans, managed by Lockheed Martin, the report did not recommend against launching the shuttle, the New York Times reports. A Lockheed Martin spokesperson told the newspaper that it would "defer to Nasa regarding specifics of the memo" but strongly emphasised "safety and quality are the guiding forces behind our workmanship on the external tank". Discovery is currently linked with the International Space Station, orbiting 352km (220 miles) above the Earth. Commander Eileen Collins described on Thursday how widespread environmental destruction on Earth could be seen from the shuttle. "Sometimes you can see how there is erosion, and you can see how there is deforestation," Commander Collins said. "It's very widespread in some parts of the world. We would like to see, from the astronauts' point of view, people take good care of the Earth and replace the resources that have been used." In her conversation from space with Japanese officials in Tokyo, including Prime Minister Junichiro Koizumi, she said her view from space emphasised how Earth's atmosphere must be protected too. "The atmosphere almost looks like an eggshell on an egg, it's so very thin," she said. "We know that we don't have much air - we need to protect what we have." The space shuttle fleet remains grounded at least until November, Nasa says. Three main problems caused concern during the mission.